Brrr! Lady Gaga and her fiancé, Taylor Kinney, stripped down to participate in the Polar Plunge at North Avenue Beach in Chicago on Sunday, March 6. The shirtless actor, 34, scooped up his leading lady, 29, from the freezing cold Lake Michigan water for the fundraiser benefiting the Special Olympics. 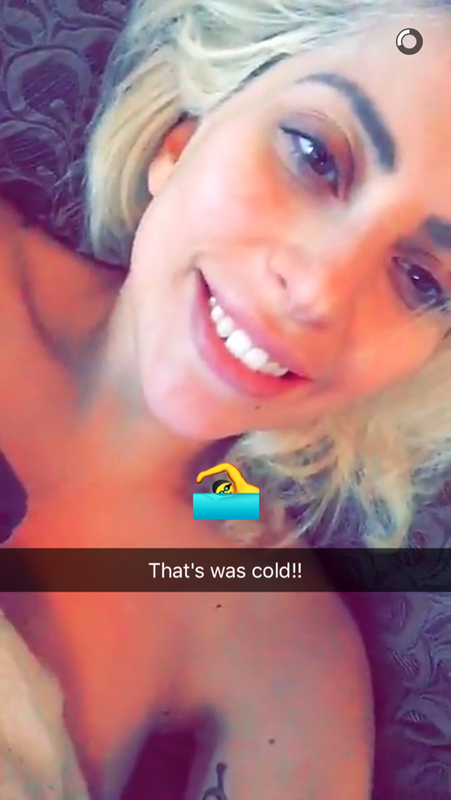 Gaga documented the event on Snapchat, and also shared an adorable photo of herself catching some warmth from an event sponsor dressed as a life-size polar bear. The “Til It Happens to You” singer — who recently performed at the Super Bowl, Grammy Awards and the Oscars — dressed down in an oversize black tee with black leggings and a baseball cap, while her hunky groom-to-be showed off his buff body before covering up in a Chicago Fire hoodie.